After my pomegranate and pistachio couscous I got a few questions about where to find pomegranate molasses or what could be used as a substitute for it. You should be able to find pomegranate molasses at your local middle eastern grocery store but if you cannot find it, it is easy enough to make if you can get your hands on some pomegranate juice. Making the pomegranate molasses is as easy as mixing some sugar into some pomegranate juice and simmering to reduce it to the desired consistency. You can also make pomegranate syrup using the same method, only stopping when it has the consistency of a syrup. This pomegranate molasses ends up with a nice level of tartness or tanginess but if you want a sweeter version you can easily add more sugar. Bring everything to a boil, reduce the heat and simmer until it has reduces to half, about 20-30 minutes. (At this point it should have the consistency of a syrup. um. did you take these pictures? phenomenal. Absolutely fabulous pictures! And thanks for the recipe! I really want to try it! Those pictures are beautiful. And the recipe doesn't sound too bad either. This is actually probably infinitely cheaper than buying a jar of pomegranate molasses! Thanks SO much. very cool photos, Kevin. I especially like the one of the pomegranate syrup. This looks quite interesting. I'm adding it to my bookmarks. "(At this point it should have the consistency of a"
Consistency of a what? is my question. That photo is stunning! Fortunately, there's a Middle Eastern grocery right by here but it's good to know I could make it myself. Thanks Kevin! I can find pomegranate syrup, but not molasses. This looks really delicious- pomegranate molasses is something I have not yet seen. It looks great! Wow! So many great recipes. I think I will try the onion gratin. It looks so yummy! What a photo! I always struggle to find pomegranate molasses, but have dog-eared so many recipes that call for it. Now I can make my own! Wow! Captivating photos! I tried making pomegranate molasses recently and it didn't turn out so well. I'm going to try your recipe next. Thanks! Thanks a lot, Kevin for these easy yet so tasty 2 divine recipes! We can't buy pomegranate molasses here in Belgium so it is great to make your own! MMMMMM,…so versatile to use to! We are lucky to have many Middle Eastern markets in the Detroit area where pomegranate molasses is readily available at around $3.50 a bottle. I like to use it in my kefir smoothies. Funny, I experimented and made this today. A wee bit tart for my family, I'm afraid and the photos are not as exquisite as yours – but mission accomplished and now can tweak. But oh man, wished I'd photograph better – yours is so enticing. Kevin, I love those photos! Funny I started on your site with another recipe went to TasteSpotting but made it back to your site via this recipe…. Great food! Beautiful photos. The recipe you've shared to use the pomegranate molasses in sound delicious! I read on another blog that this kind of molasses would pair well with duck as a marinade, glaze or sauce of some sort. What do you think? Thanks in advance for your help! Rebecca: The pomegranate molasses would work really well with duck in a sauce or a glaze! I saw this on dmblgit – fun pic. I love pomegranate molasses. I use them in ribs and in for a tangy Middle Eastern twist on lamb ragu. I just tried this recipie and when i took the mixture out of the pot, it still had a juice consistency. Should it get thicker when it cools? Kendrick: It can be a bit difficult to figure out when to pull it off the heat. If you are making the syrup your want to pull it off when it has a syrupy consistency. If you are making the molasses then a good indicator is when it starts to bubble furiously and rise. I'm going to try both your lamb chops recipe and couscous recipe for New Year's Eve dinner tomorrow but I'm going to substitute chicken in place of the lamb. My nearby Whole Foods only had pomegranate syrup, not molasses. How would you suggest I convert the syrup into molasses? 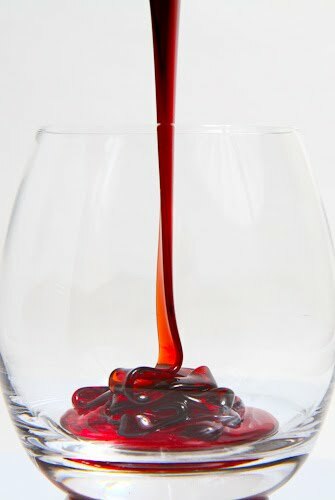 Or…how would you suggest converting the pomegranate/red wine sauce if I use syrup instead? I agree – gorgeous photos! 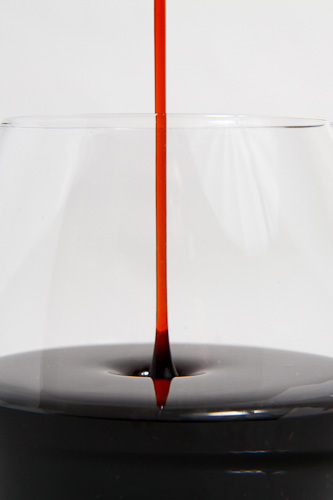 Anonymous: Pomegranate syrup and molasses are pretty much the same thing, only the molasses is more concentrated. If you have the syrup and the recipe calls for molasses you can simmer some of the syrup until it reduces and takes on the consistency of molasses. If the recipe is for a pan sauce then you could just add more of the pomegranate syrup to the sauce and simmer the sauce a bit longer to remove some of the extra liquid.